Is your child crawling all over the home, trying to complete secret espionage missions known only to him? Does his try to wriggle his way into the tiniest of spaces, just to get the jump other members of the family? Does he yearn to fight against super villains alongside Captain America, Black Widow, and The Avengers? Well, it sounds like your child is ready to assume the role of Ant-Man! Of course, it might be hard to find one of Hank Pym’s Ant-Man suits just lying around! We’ve been trying to develop our own version, but we haven’t quite mastered the use of Pym Particles just yet. The good news is that with this child Ant-Man costume, your child has the opportunity to look like the Marvel superhero from the movies. This officially licensed costume faithfully recreates the look of the suit from Marvel’s Ant-Man and the Wasp. It has printed textures on the exterior, making it look like armor. The attached foot covers can be worn over any pair of shoes, so your child can wear their favorite footwear with the costume. It also comes with a foam belt that has bright red details on the front and sides. Finally, the molded mask is shaped like the one seen in the movie and fits with an elastic band around the back. 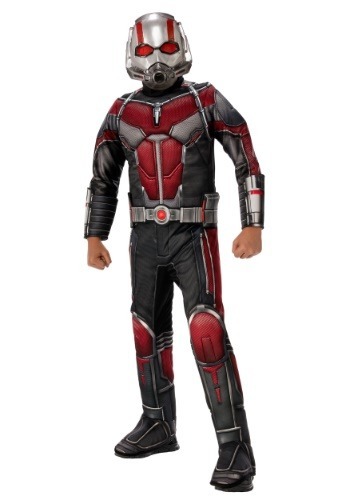 Once your child is outfitted in this Ant-Man costume, they’ll be ready to take on any threat in the world! Ghost, Yellow Jacket, and even Thanos won’t even stand a chance against your child. Well… maybe Thanos would be a match for your child, so if your child decides to battle it out with him, then you might want to grab a few more of the Avengers to join the battle against evil! Be sure to check out our other Marvel costumes to create the team.